Steven (Chicagoland, United States) on 28 May 2015 in Plant & Nature and Portfolio. 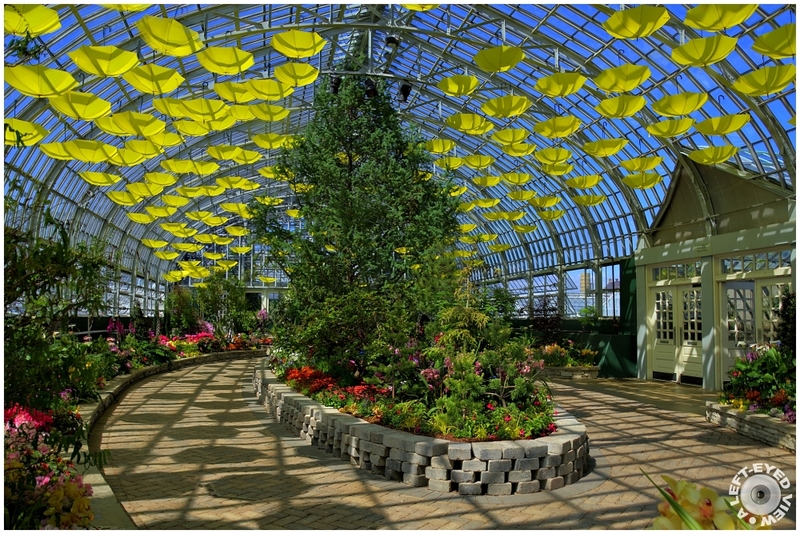 Garfield Park Conservatory’s 2015 Spring Show, “Sun Showers,” opened on February 14, 2015. Continuing the Conservatory’s grand reopening year theme, "Sun Showers" celebrates the revival of the Show House and its seasonal shows following the terrible hail storm from June 30, 2011 which left much of the Conservatory severely damaged with so many panes of glass shattered. More than 200 yellow umbrellas hang from the glass ceiling, celebrating both the rain and sun that bring us hopeful spring flowers. Hundreds of blossoms including azaleas, camellias, daffodils, hyacinths, hydrangea, orchids, and tulips fill the room with their beauty and aroma. The Spring Show reminds Chicagoans in the midst of winter that warmer weather and colorful gardens are soon to follow. Photo captured April 27, 2015. Like the color of sky in this shot! J'aime beaucoup!!! très belle photo! Une belle image qui nous offre un très beau décor ! Another superb composition in the Conservatory ! My favourite view - wonderful! Stunning image !! Colorful and beautiful. This is a marvelous looking place and the picture spectacular. Excellent. This is so much a place of awe, feels more like a private conservatory ! The clarity and colorfulness of the image are wonderful. Every shot of that place is a delight. Magnifique ! Belle idée ces dizaines de parapluies jaunes qui illuminent la voûte comme des soleils et en même temps ombragent l'allée. Congrats on the Color Spotlight with this delight ! Well done. Wonderful scene. Beautiful colours. Excellent. A wonderful place with a beautiful display of colors ... Splendid image !!! Spectacular photo, Steven. Congratulations on the Spotlight. A beautiful image of this wonderful space. A real treat. A very pretty place to photograph. You do like those yellow umbrellas! A beautiful conservatory. Wonderful view and perspective, perfectly exposed with great colors ! I clearly value the most that strong and awesome pattern of yellow shapes on top of the structure and their equivalent pattern on the floor created by the shadows. Eye-catching ! Great exposure. What a lovely place! Congratulations on the spotlight, a magical environment ! Well, it was quite natural to get into the Spotlight! The image is so full of colours in a delightful contrast! Congratulations!! !